According to AOL news, nearly two months after the Midland Police Department learned of the game, the two officers were suspended for three days without pay, according to findings of the internal affairs investigation obtained by The Associated Press through a public records request. The investigation found the two officers, Derek Hester and Daniel Zoelzer, violated the department's professional standards of conduct. There is no ordinance against panhandling in Midland, an oil-boom city of more than 110,000 where a recent count put the homeless number at about 300. About a quarter of those are transient. "The fact that they are making sport out of collecting the personal property of homeless individuals could be seen as them targeting these individuals for discriminatory harassment, simply holding a sign is absolutely a protected part of our free speech." said Cassandra Champion, an attorney in the Odessa office of the Texas Civil Rights Project. According to the investigation report eight signs were found in the trunk of Hester's patrol car on November 20 and Zoelzer had thrown about ten signs he had confiscated into a city trash container after Hester called him to warn him he had been reprimanded by his superior for having the signs. The two told the internal affairs investigator, that they were issuing criminal trespass warnings when they took the signs. But according to the report, no homeless people were issued criminal trespass warnings by either officer in 2013. Most of those warnings in Midland are written, but some are verbal. Police Chief Price Robinson said the actions were an isolated incident in a department of 186 officers and didn’t deserve a harsher punishment. After the investigation of all officers were reminded to respect individual rights and human dignity, he said. Visit the Source for more details. “Success will be measured by ensuring that the federal government supports African American educational excellence." Watch David Johns, The Executive Director to the White House Initiative on Educational Excellence for African Americans speak on black masculinity and closing the achievement gap. Obama to award minority vets with Medal of Honor. According to an article on BlackAmericaWe.com, President Barack Obama will award the Medal of Honor to 24 Army veterans who were systematically overlooked because of their racial and ethnic backgrounds. The ceremony, scheduled for March 18, will honor Army veterans of African American, Hispanic and Jewish heritage who were bypassed because of discrimination during World War II, The Korean War, and The Vietnam War. Only three of the recipients are living and one honoree, Staff Sergeant Melvin Morris, is African -American. In 2002, Congress called for a review of war records from World War II, the Korean War and the Vietnam War to ensure that soldiers deserving the Medal of Honor were not denied because of prejudice. The ensuing research identified a number of deserving candidates. Of the 3,464 Medals of Honor awarded, just 88 have been given to 87 individual black Americans.In 1900, William Carney was the first Black recipient. Through this unusual ceremony, the president is signaling to the nation that racial prejudice is wrong and, when possible, past biases should be acknowledged and corrected. At the White House this week, Obama met with several civil rights leaders including Rev. Al Sharpton about raising the minimum wage, black unemployment, health care, voting rights and education. Sandra Khalifa, co-communications director of Dream Defenders, was in her Tallahassee apartment coordinating a Twitter strategy, and within an hour, she and a few other staff members created graphics capturing the team’s emotions and tweeted them. #NeverLovedUs was trending a few hours later, because the group has no official office and all voulenteers work from home, most member communicate via cellphone and email over how to respond. The Dream Defenders do not have a physical reach beyond Florida, so they rely heavily on social media to nationalize their message and galvanize support around local causes. Jelani Cobb, associate professor and director of the Institute for African American Studies at University of Connecticut in Storrs, told NewsOne that social media is as vital to the group today as the advent of television was to the civil rights movement. Mini-houses to solve big problem. There is a new wave sweeping across parts of the United states, in an effort to stop homelessness as reported by AOL.com. 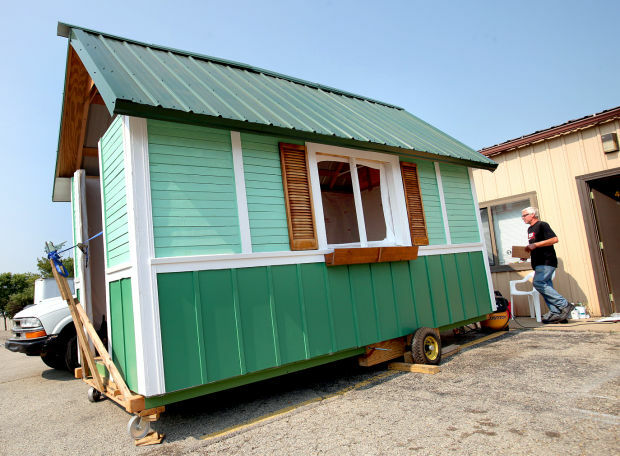 People across the nation, specifically advocates and religious groups to build these compact houses because they are cheaper than traditional large-scale shelter, help recipients socially by being built in a communal settings and are environmentally friendly due to their size. Organizer Brenda Konkel hopes to allay neighbors' concerns by the time the City Council votes in May on the group's application to rezone the site of a former auto body shop to place the houses there. Plans include gardens, a chicken coup and possibly bee hives and showers and bathrooms in the main building. The house, which cost about $5,000, fits a double bed with overhead storage, a small table and a small room with a compostable toilet. There's no plumbing or electricity, but the home is insulated and has a propane heater to get the residents through the rigid Wisconsin winters. High School graduation for cancer stricken youth. Dom Cooks, 18, a senior at Decatur High School in Federal Way, Washington who suffers from an inoperable brain tumor, celebrated an early graduation with his twin sister Thursday night after doctors gave him two weeks to live, reports KIRO 7. Cooks and his twin sister, Diamonique Cooks, received their diplomas in a special graduation ceremony organized by the school and the community to ensure that the Cooks twins would be able to share the momentous occasion together. jason Collins, 35, is expected to sign a 10-day contract with the Brooklyn Nets today and will be available to play with the team when they meet the Los Angeles Lakers tonight in the Staples Center, reports Yahoo Sports. "Jason told us that his goal was to earn another contract with an NBA team. [Sunday], I want to commend him on achieving his goal," NBA Commissioner Adam Silver said in an issued statement. "I know everyone in the NBA family is excited for him and proud that our league fosters an inclusive and respectful environment." After Glen "Big Baby" Davis decided to sign with the LA Clippers on Sunday, the Nets moved onto Plan B – bringing Collins back into the NBA, sources told Yahoo Sports. After agreeing to a buyout with the Orlando Magic, Davis is expected to clear waivers at 5 p.m. on Sunday and will sign a deal for the rest of the season with his former Celtics coach, Doc Rivers, and the Los Angeles Clippers. Collins revealed his sexuality in the spring, and had gone throughout the NBA preseason and regular season without a job offer. Once the Nets missed out on free agent Davis on Sunday, they moved to complete the process of signing Collins as a backup big man.